i hope you've all had a Happy Halloween! i'm not a big fan of Halloween, so the whole family (including the dogs!) went out to dinner :) my riding instructor was out of town today, so it was just another day of practicing the trot. i'm telling you, the seated trot is the pathway to amazing abs! 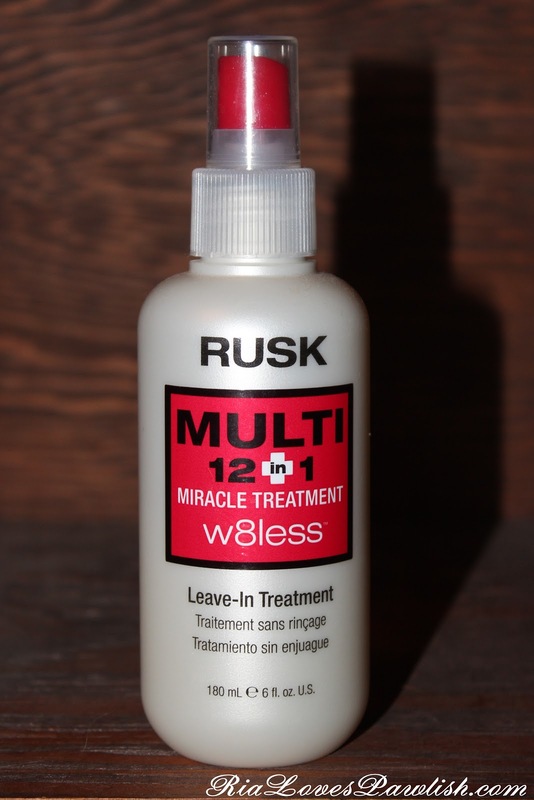 today's review is for Rusk Multi 12 in 1 Miracle Leave-In Treatment. this really could be called all in one, because it basically does it all, from leave-in conditioner to heat protectant! the packaging states that 'It immediately controls frizz, smoothes, detangles, moisturizes, strengthens and adds body to dry, damaged hair and more.' and that it 'Can be used with heat and acts as a thermal protectant to provide shine, control and conditioning from the inside out.' i think this really is a great all around product, it's ideal for people who want something easy! the only thing that didn't work about it for me is that it is not a strong enough moisturizer for severely damaged (mine was massively over-processed and completely fried earlier this year) hair. i absolutely love that this product is also a heat protectant, it's just so convenient... not to mention great for your hair! Rusk Multi 12 in 1 should be available most places Rusk products are sold (like Ulta!) for $15. yesterday i found two Color Club collection sets at Marshalls... i was surprised because i had never seen them there before! it's nice that they are in their actual collections, as opposed to the ones you get at Ross that are just a mash-up labelled 'All About Color'. i had thought that these bottles would have name labels (the All About Color ones don't), but no such luck :( the other bummer is that the price at Marshalls is $2 more, $9.99 as opposed to $7.99 at Ross. however, i think it might be worth the $2 to be able to more easily find out the names! i really hope Color Club starts adding name labels to the polishes in its sets soon, it's something everyone complains about. here are the two sets i got, both are glitter collections! well, i think we had a little earthquake here in Monterey tonight! just a little shake, enough to creep you out if you aren't used to them... and i'm definitely not used to them! apparently it shook a lot more upstairs than downstairs... my mom came running down the stairs to see if we had felt it. life is nothing if not always entertaining! today's polish is Barielle Welcome Ohm, a light mauvey plum creme. the formula is nice, easy to work with and opaque in two coats. it dries shiny on its own, but i do prefer the finished look it has with an added topcoat! two coats Welcome Ohm, one coat Seche Vite. i decided to put Nicole by OPI Make U Smile over yesterday's Barielle Suntini mani. it's a silver glitter with large hex and microglitter pieces. the pieces really look mirrored, it's a beautiful color of silver! i wasn't delighted with the formula... the clear base really overwhelms the glitter, the pieces don't want to stick on the nail. the large pieces were difficult to place... i found with two coats there were significantly more large pieces, but they still wanted to congregate at the top of the nail. it's still a pretty polish, it just offends my OCD sensibilities a little bit! it dries pretty smooth on its own, one coat of topcoat is all you'll need to seal it off. 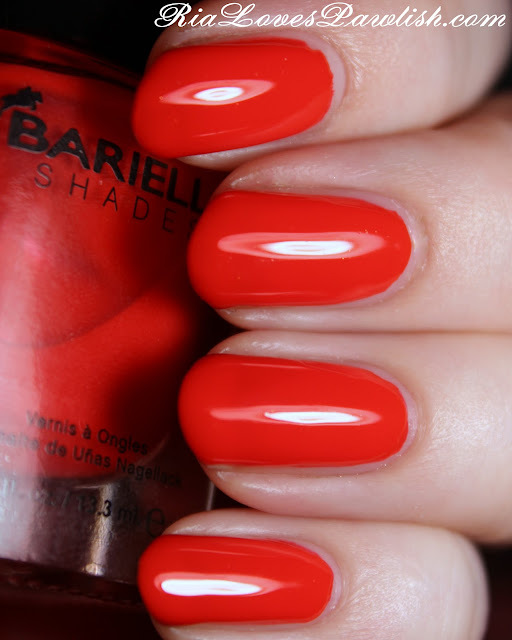 two coats Make U Smile over Barielle Suntini, finished off with one coat of Poshe Topcoat. i got some exciting Sation press info from Miss Professional Nail in my email today and i couldn't wait to share it with you all! their upcoming six polish collection is called 'Holiday Golightly' and is inspired by Audrey Hepburn's character Holly Golightly (and her love of gems!) in Breakfast at Tiffany's... how cute is that?! 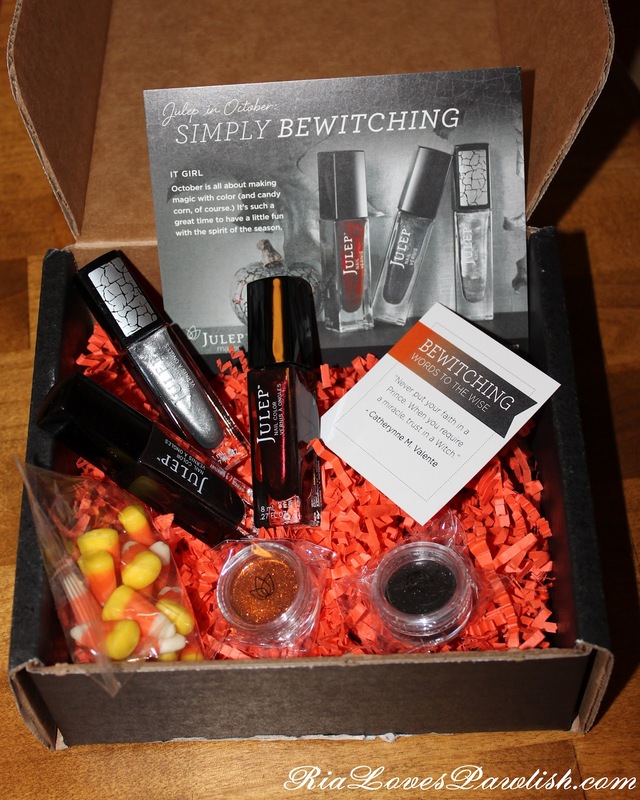 and here is their yummy descriptions of the colors! “Under the Miss-letoe,” a pearlescent pine green; “Feliz Navi-doll,” an icy crystalline grayish-white; “I Love Yule,” a velvety poinsettia red; “Let’s Mingle & Jingle,” a silver-spangled sapphire blue; “Holiday Golightly,” a glistening Robin’s egg blue, and “Stop Scrooging Around,” a gold-sparkled ruby wine." *update* the release date got pushed back a little bit, but you should be able to find the collection in mid-November at beauty supply stores and online at Miss Professional Nail here. the collection is available for viewing and pre-order online now, this is the direct link!! after yesterday's post i found myself wondering how close Maybelline Color Show Boho Gold is to OPI Just Spotted The Lizard. you find the initial review for Boho Gold here and the one for Just Spotted The Lizard here. i was pleasantly surprised to find that they aren't even close to being dupes! Boho Gold is far more coppery than Just Spotted The Lizard, and Just Spotted The Lizard has a stronger green shift than Boho Gold. 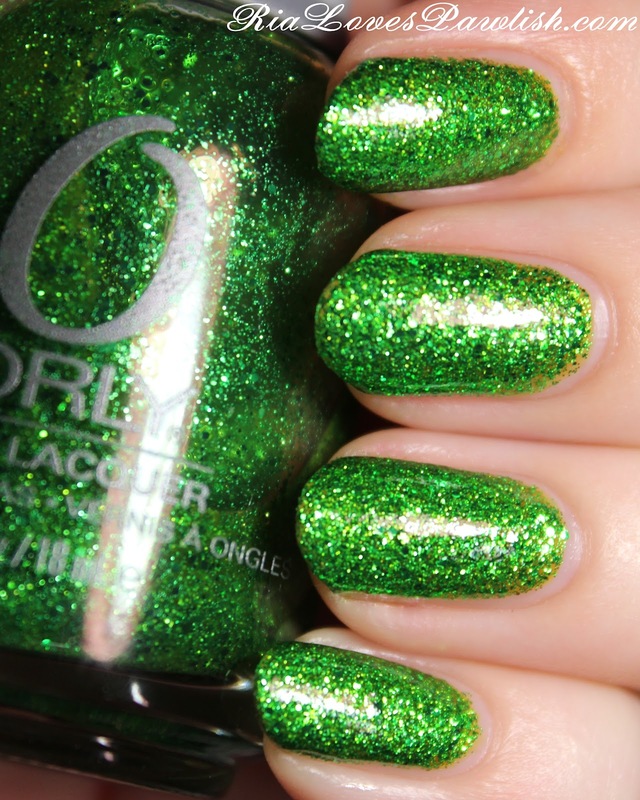 Just Spotted The Lizard wins formula wise, it was two easy coats for full opacity, opposed to Boho Gold's three coats. the brushstrokes are slightly more visible in Just Spotted The Lizard, but not enough to be annoying to anyone. Just Spotted The Lizard on pinkie and middle, Boho Gold on ring and pointer... both are topped with one coat of Seche Vite. i would definitely say these are different enough to warrant getting both, especially if you're a big duochrome fan! i'm glad i have both :) i'm not even sure which i like better, i'm really into both of them! 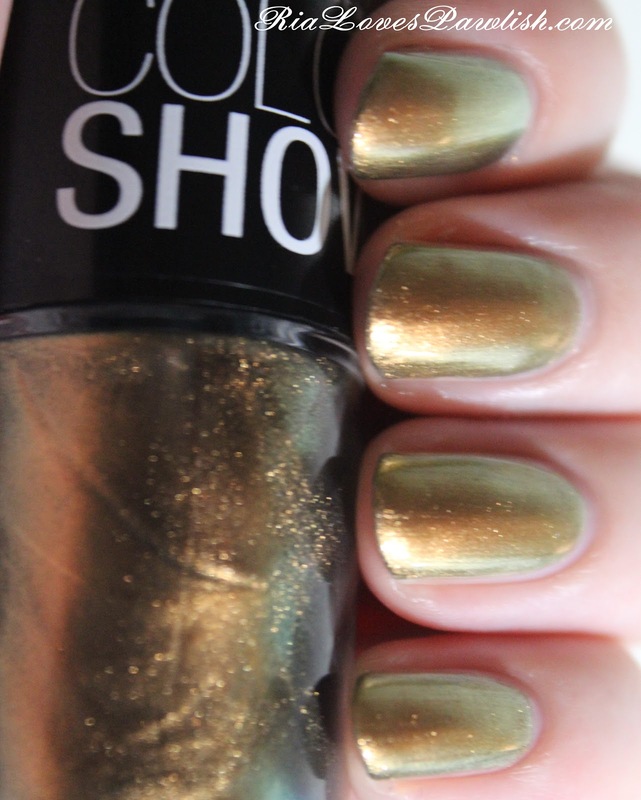 today we have Maybelline Color Show Boho Gold, a shimmery coppery gold to green duochrome. it's from their Scene On The Runway collection! to get the duochrome to really show up, you'll need at least three coats. at two coats, the color change wasn't as strong and it was decidedly thin at the tips... you'll definitely want to wrap them with this polish! the color change is (of course!) much stronger in the bottle... but it is a pretty strong shift. adding topcoat adds a little shine and helps even everything out... this polish will show any imperfections in your nails! three coats Boho Bold, one coat Seche Vite. and in different lighting... the green shows up a bit more, but it was hard to capture on film! it was quite warm today here in Monterey... i'm so glad i went riding yesterday and not today. i can't even imagine how hot it must have been in Salinas if it was hot in Monterey! it's crazy the way you get used to things... in Virginia 75 degrees is pretty cool... but when it's always 60 degrees, 75 is stifling! today we have Pixi Amazing Amethyst! it's a very blue toned purple pearl... almost a blurple! the color is extremely saturated, it looks really rich and beautiful on the nail... it's more beautiful on the nail than in the bottle. the formula is great, good coverage at one coat, complete coverage at two! i did have one bald patch on my ring finger, so i did add an extra coat onto that one... but that was a user application error, not the polish. it dries fairly dull, so you'll definitely want to add a shine topcoat! two coats Amazing Amethyst, one coat Seche Vite. two coats Classy Cocoa, one coat Seche Vite. i can't tell you how excited i was to get home from grocery shopping today to find multiple packages on my front porch! and yes, inside one of them was the long awaited Color Club Halo Hues holographic collection. 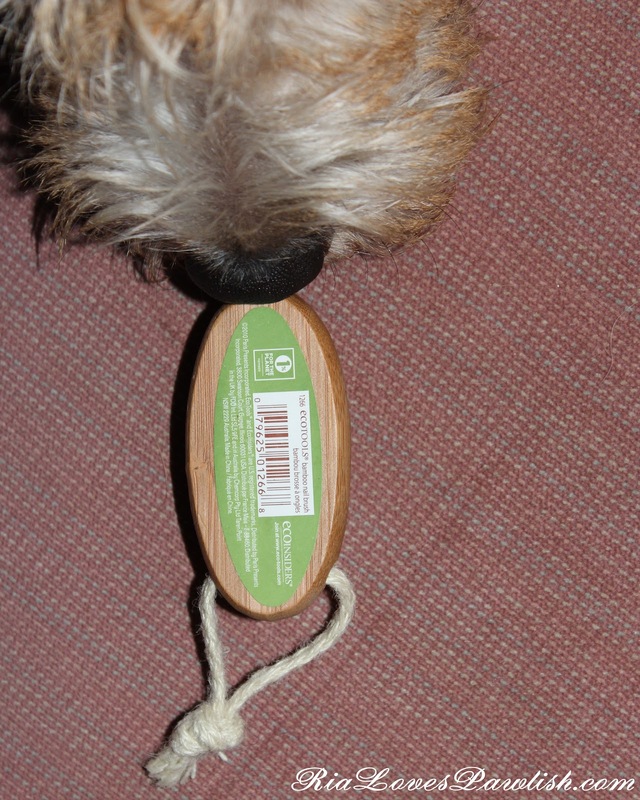 imagine how disappointed i was to open up the package and find that one of the polishes i had ordered had been left out! so as of now i am still missing Cloud Nine. since i live on the West Coast and the company headquarters are on the East Coast, it was already too late to get a hold of someone to discuss my order. since i have now already called and emailed just trying to find out where my order was, and haven't heard back... i'm dreading the process of trying to get this bottle sent! to make matters worse, they didn't even include an invoice or shipping manifest in the box... so, i can't know if they left it out accidentally or if it was out of stock. i really love the brushed nickel look of the lids, i think it makes them seem much more chic, and the little flower on top of the lid is so cute... i'll put a picture of it in another post :) the holographic qualities are very apparent even in the bottles, unlike some holo polishes which you would swear were just regular until they are on the nail! today was Mr. Pawlish's birthday! he chose to go to Sapporo's for dinner... i'm glad that he loves my favorite restaurant, too :D i still think it's wild that my mom an my husband's birthdays are only separated by one day! we decided that Jewels's birthday would be the day in between, since we don't know exactly when she was born. so, she's now a year old :) i can't believe she's already been with us for four months! 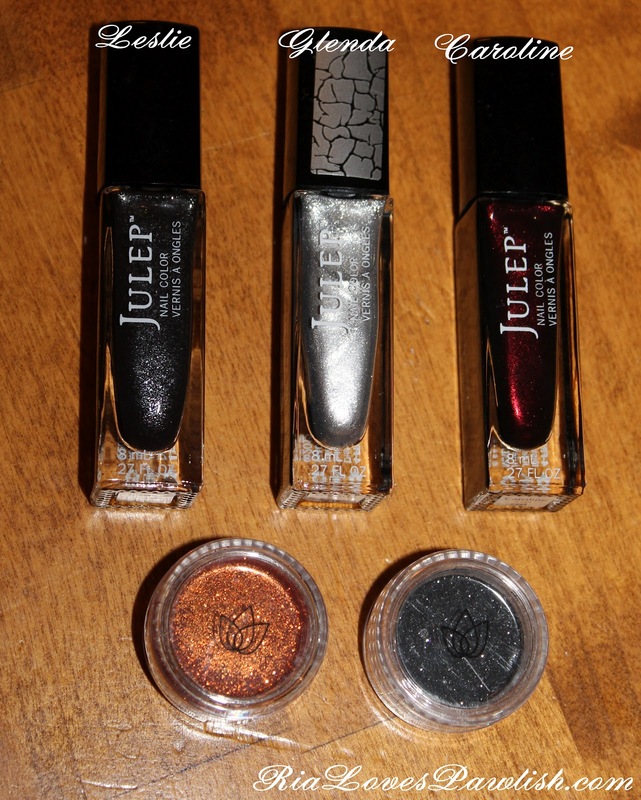 today i added Julep Glenda to yesterday's Julep Leslie mani, it's a sliver crackle. i really love the finish, it dries to a shimmery foil. 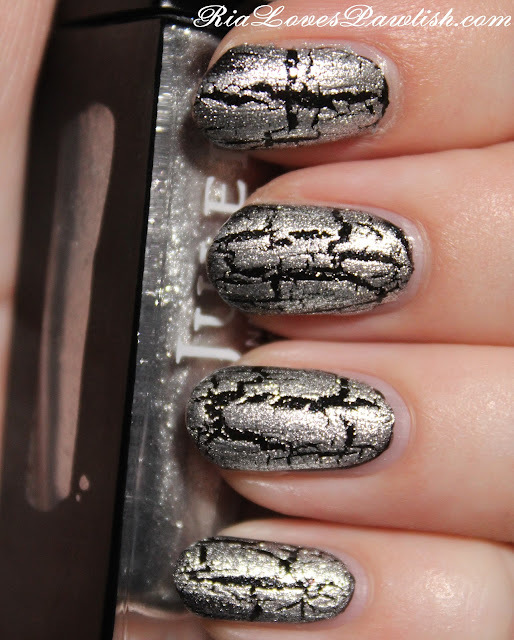 like most crackles, i applied this one like i do all crackles, one thick coat, trying not to go over the same spots more than once. this one still cracks even if you do have slightly more more polish layered up, though :) you definitely want to add a topcoat to bring out all the shimmers and pick up the shine from the base polish! i topped off my mani with Poshe Topcoat. i can't believe i keep forgetting to tell you guys that the Color Club Halo Hues collection has finally been released! you can see nail wheel swatches from Cosmoprof here... it's a holographic collection! you can buy them off shopcolorclub.com here... that's what i did. however, i'm not impressed with their ordering system. i ordered mine a week ago and i haven't heard anything from them... i've even tried to get in touch about my order and i still haven't heard back! i will definitely keep you guys updated. 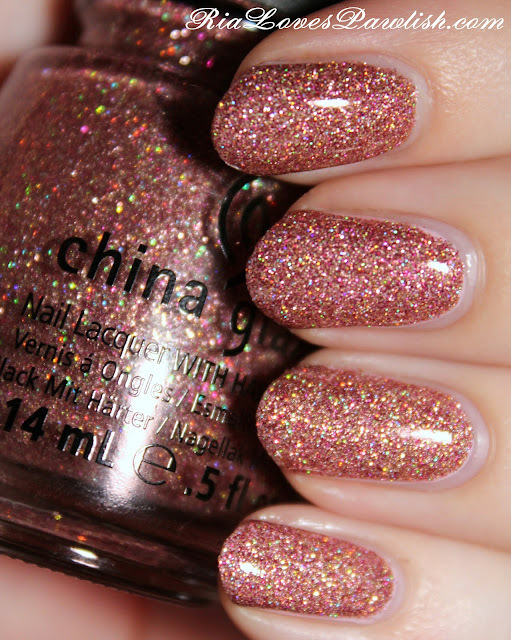 the polishes should be available at drugstores that sell Color Club soon. today's polish is Julep Leslie, a black glass fleck shimmer. this one came in my October 2012 Julep Maven It Girl box. this is a good one for people who want to wear black polish, but don't want to go all out with a black creme... the shimmers soften up the effect! the formula is good, you could make this a thick one coater, but i prefer how it looks with two coats. i suggest two coats of topcoat with this one, it will bring out all the light colored flecks! two coats Leslie, two coats Seche Vite. today's polish is Maybelline Color Show Shocking Seas. it's a nice teal leaning blue creme that is opaque in only two coats. the formula is pretty good, a little patchy on the first coat, but it evens out beautifully on coat two. it's much more vibrant than the photo shows, this is one of those colors that freaks out my camera! two coats Shocking Seas, one coat Seche Vite. started learning a new skill today at my horseback riding lesson... the seated trot. just when i'm finally getting trotting down, a new curve ball! trying to learn how to bounce with the horse's movement, but not bounce crazy high... it's super tough. you start to wonder if your spine just might snap in half... :D so, that's my new goal, once i master this i can move on to the canter! today's Basically... product is one i'm super excited to share with you all! 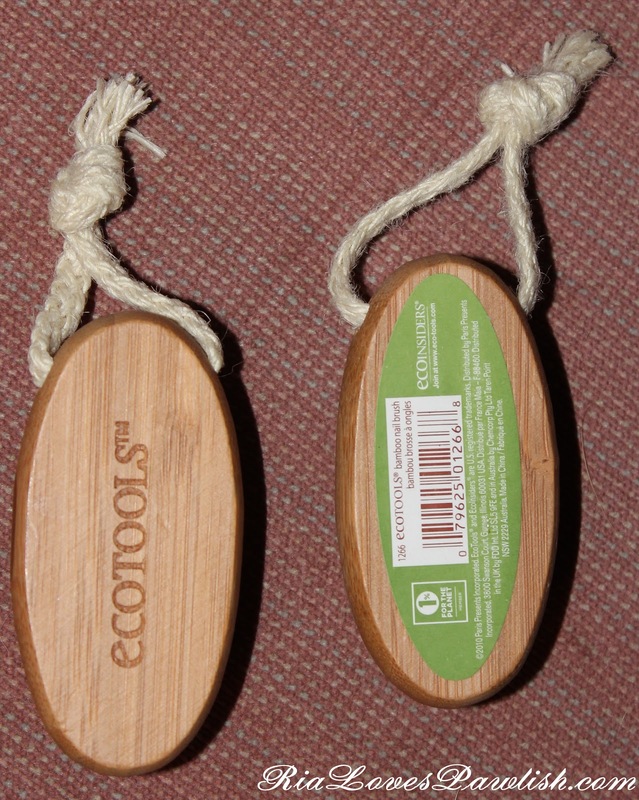 it's EcoTools Bamboo Nail Brush... and it's amazing! i've been desolate because somehow mine got lost when i moved to Cali and i haven't been able to find a replacement... but i finally found them at Pharmica... and they are under $5! you can also get them here on the EcoTools website for only $1.29. 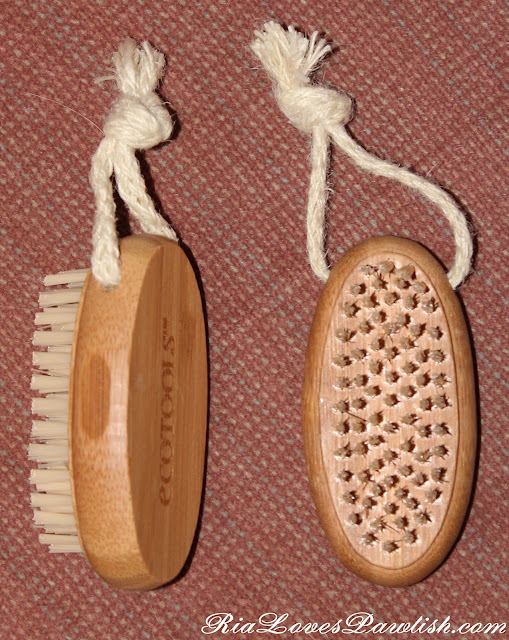 the handle is made out of bamboo and the bristles are plastic. i'm not sure what makes it so different than other nail brushes, it really doesn't look that much different... however, i've tried lots of nail brushes and it's just so much better! i use it all the time since i have so much free edge, i keep one in the kitchen and the bathroom... you don't want anything staying trapped under your nails... not a good look (not to mention unsanitary, especially when you're cooking!). i highly recommend using it every time you remove polish, really scrub and get rid of all the lingering polish and remover residue. it helps your cuticles to look more fresh, too! today i have the last of my Layla Softouch Effect polishes to share with you! this one is 05 Cherry Diva, it's a cool toned red with gold shimmers... certainly a cherry diva color! like all of this line, it's beautiful both in its natural matte-like finish and when a shine topcoat has been added... this one is really like getting two polishes in one as the color even changes when it's made shiny. in its natural finish, the color is dusty and soft, with topcoat the red stands out much more... it's a darker red and the gold shimmers stand our in much sharper contrast. 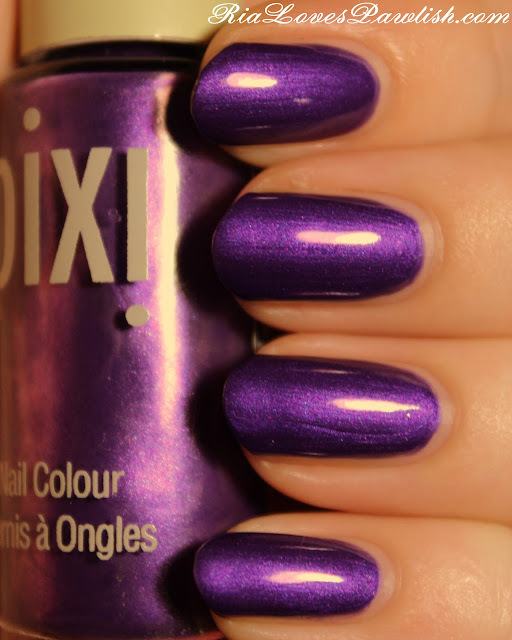 the formula is excellent, it flows easily and is opaque in two coats! two coats Cherry Diva, pinkie and middle fingers are topped with one coat of Seche Vite. i tried something different with the swatchie today, i added topcoat to my pinkie and middle fingers and left the other two without. i thought it might be nice to be able to see the differences right next to each other... let me know which way you prefer! spent the day doing some swatching and watching Guys With Kids... i'm not really digging the show. but i might keep watching it because i love Tempestt Bledsoe! it seems to me that tv shows are just trying to hard to be funny lately, they need to stop forcing the humor. the new stuff has nothing on old shows like Cosby and Home Improvement! today's polish is Layla Softouch Effect 06 Limoncello, a gorgeous lime green shimmer... with a non-shiny finish! 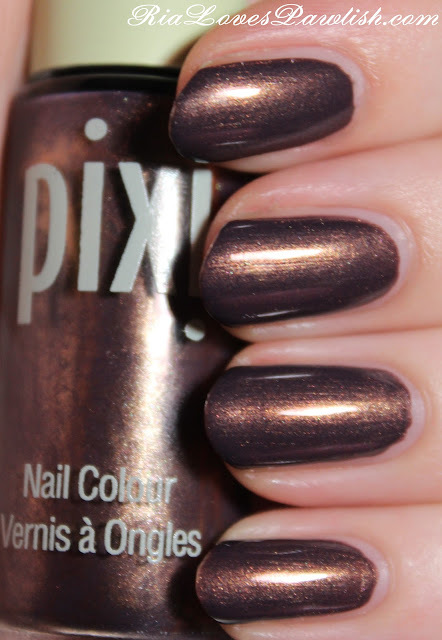 the matte-like finish of this polish is a nice surprise, you automatically expect shimmers to be super shiny. and, of course, if you decide you feel like some shine, it's as simple as adding a shiny topcoat! this one is a bit more sheer than most of their Softouch line, at three coats it still wasn't absolutely opaque. it does look really nice, you could also layer it over a different polish to change the color a bit! topped off with one coat of Seche Vite! 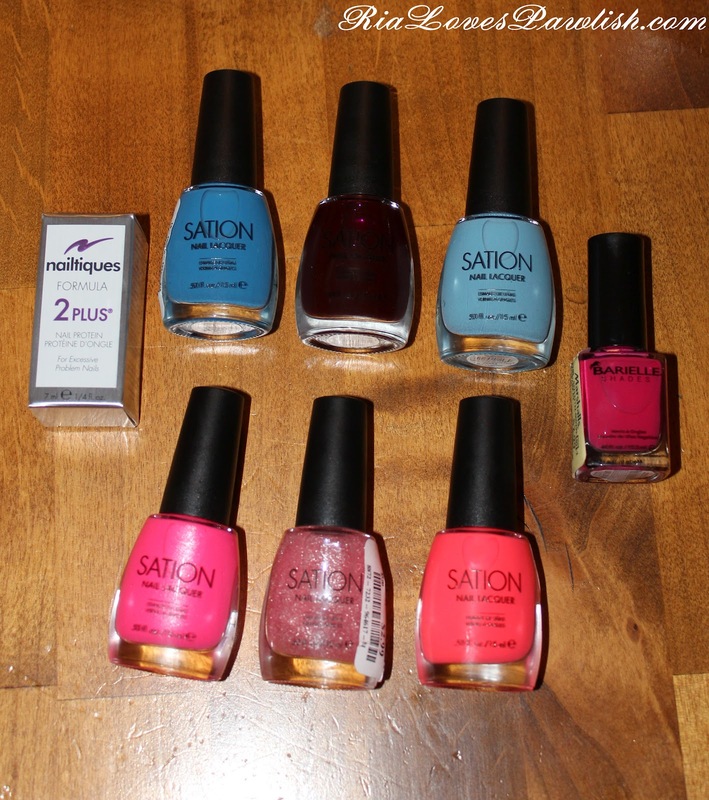 and now focusing in on the polishes! 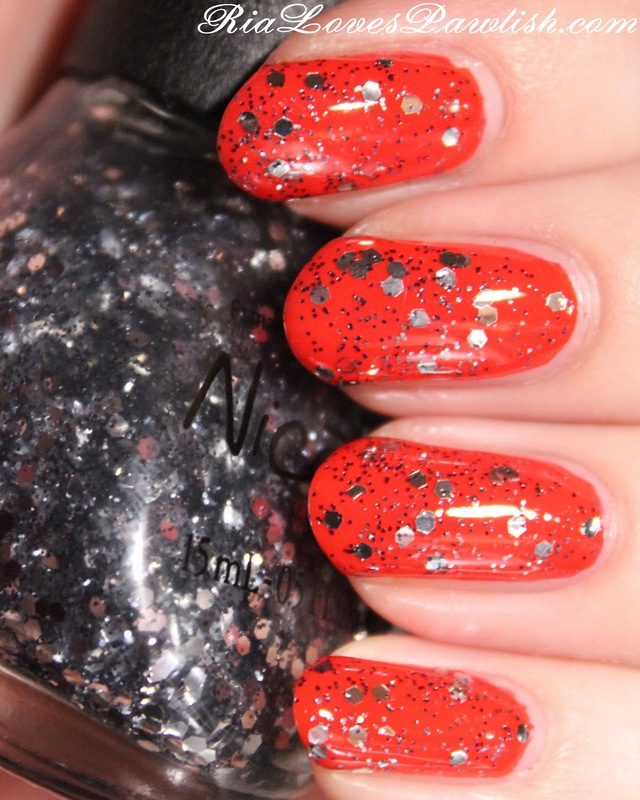 the extra treatie this month was two glitters, one orange and one black! i think it's so cute that the little glitter jar has the Julep flower on it. 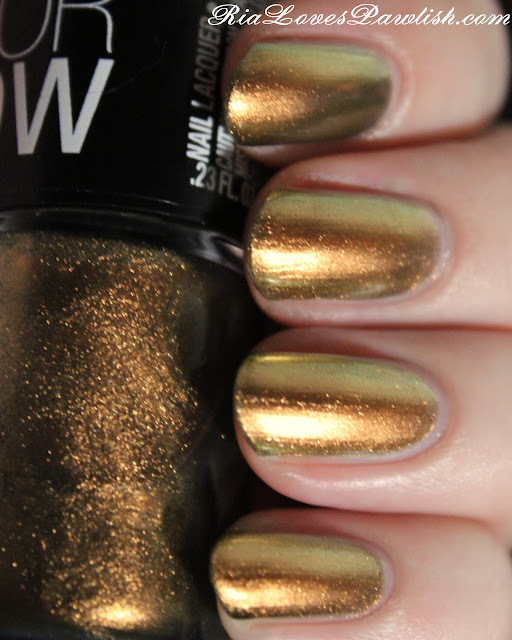 today's polish is the final Sation polish i was given for review, Shiny Gold. this one is a buttery cream frost with some shimmer to it that is quite sheer. i used three coats and it's still not fully opaque. this is a polish i would use as a glaze over another opaque polish rather than by itself because i don't like to see my nail line. however, i know a lot of people that love the look of just a hint of color over their natural nails! 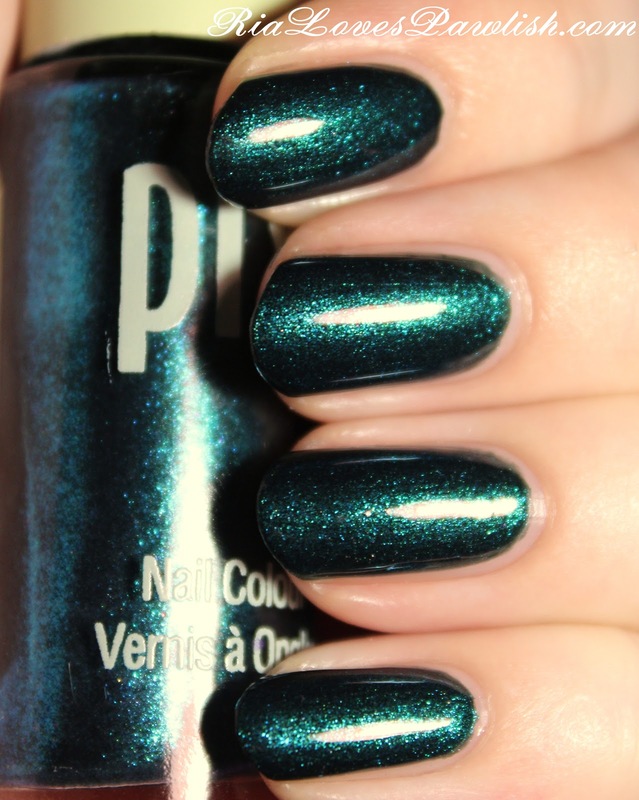 if you like that look, this a great polish. even though it's a frost finish, the brushstrokes are not very noticeable. three coats Shiny Gold, one coat Poshe Topcoat. 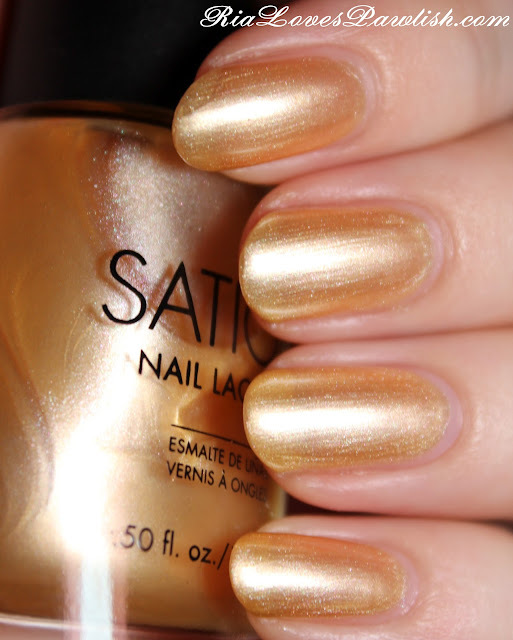 Sation polish can be found at their website and select Marshall's, TJ Maxx, and Winners stores!